Casting modulus Mc according to eq. 1 is defined as the ratio between volume and the heat-emitting surface (overall effective cooling surface) and is used for the approximate determination of the solidification time in a single casting section. 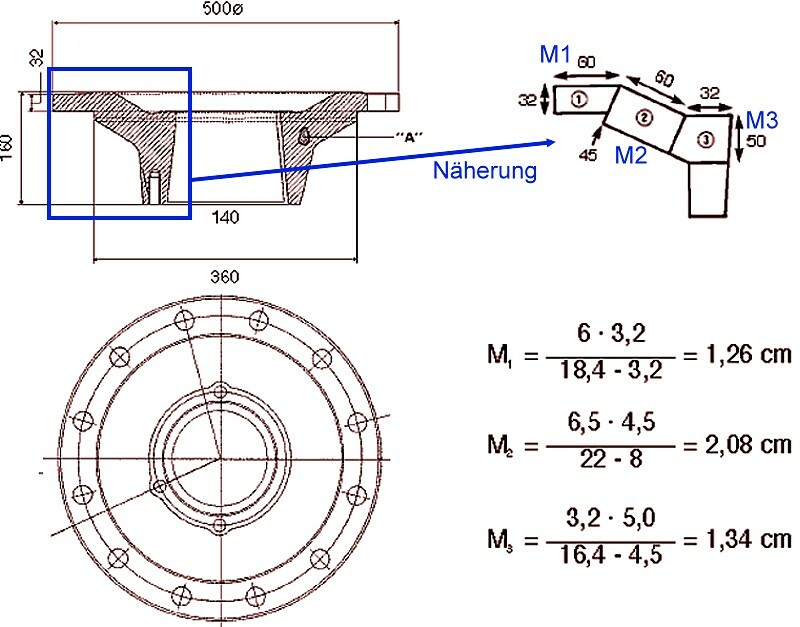 The casting weight and wall thickness are not enough to be able to determine the cooling rate (see Chvorinov’s rule, Shape factor). 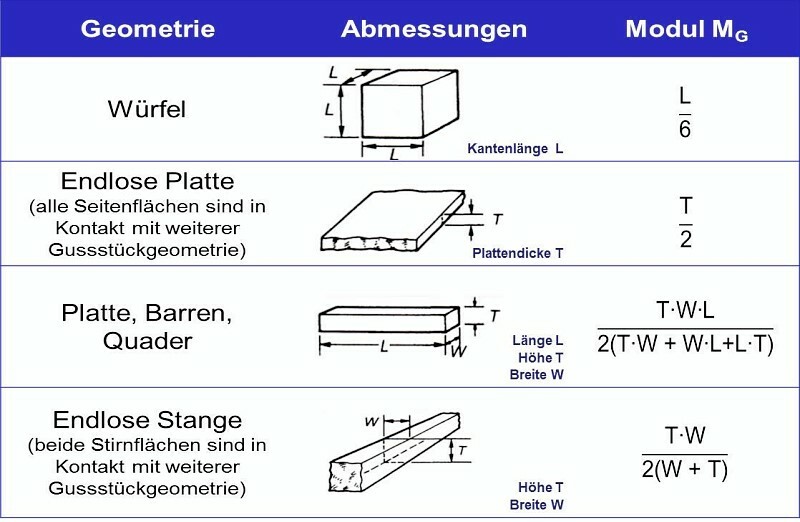 Although simple molds of the same dimensions such as cubes, plates, rods and ingots may have the same thickness, e.g. 15mm, they cool at different rates due to the size of the heat-emitting surfaces. Complex castings need to be broken down into sections of simple geometry for which the modulus is calculated separately. Figs. 1 and 2 provide an overview of the modulus calculation for simple geometries. The significant modulus is M2=2.08 based on the dimensions derived from Fig. 3 In this section, a high rejection rate due to the formation of cavities (see Cavitiy) has to be expected if risering is insufficient (e.g. if risers are undersized). Another simpler way of detecting critical casting sections is to apply Heuvers’ circle method. 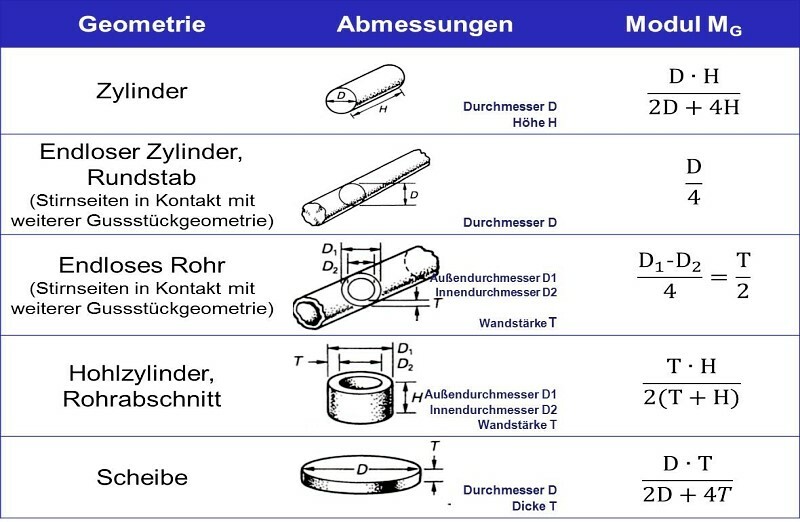 Gusseisen mit Kugelgrafit - Das Wichtigste über Anschnitt- und Speisertechnik, published by Rio Tinto Iron and Titatnium Inc., source: http://www.sorelmetal.com/de/publi/Gating-risering-de.pdf.